The effect you want your white to achieve in your finished drawing plays a large role in determining which white is right for you. Do you want precision when applying your white? What about opacity? Do you use your white primarily for the catch lights in the eyes and the highlights in the hair? Or, like me, do you tend to use it everywhere? The amount of highlighting you do and the precision with which you do it, as well as the relative translucency or opacity that you need, can all help you choose which white is best for you. Let’s examine some of the choices we have as Copic artists to find out which ones do what. There are numerous brands of white gel pens on the market but they all have a few things in common. White gel pens have metal roller-type tips that are perfect for producing a smooth, consistent line. Because it’s a ball point, the line it produces is a “deadweight” line that is more or less the same thickness from side to side no matter which direction you tilt the pen. In general, gel pens contain an ink that is at least slightly translucent. This translucency is due in part to the fluidity necessary to allow the ink to flow smoothly through the tip. Because it’s slightly translucent, the underlying colors show through the white ink highlights, giving a soft, diffused lighting effect. Its precision mark making and softness make it an excellent choice for Manga style drawings or for outlining letter forms. When you want a slightly translucent white and a precise application in small areas, a white gel pen is the perfect choice. 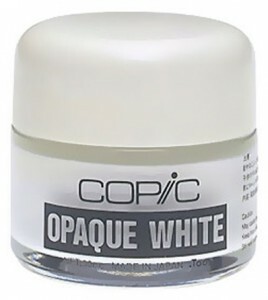 Copic opaque white is a very thick, water based paint that comes in small jars. It is best applied with a small paint brush and is easily thinned with water. When applied straight from the jar, it creates thick, opaque highlights with a slightly chalky dry brush look. When thinned with water, it creates smooth lines that are more or less transparent, depending on how much water has been added. Because it is applied with a brush, a wide variety of line weights are possible. Once dry, it can be partially removed with a cotton swab dipped in water if you find you’ve made a mistake, although once removed, the area is difficult to work back into, and may be slightly rough to the touch. When you need a super opaque white that can create a variety of marks from fine point catch lights to long flowing lines of varying weight, Copic Opaque White is a good white for the job. However, because of its thickness, it is a little more difficult to use than the next white on the list. M. Graham Titanium White Gouache is a medium bodied, light-fast opaque white. It contains no chalk or other additives, and is a clean, bright white that will not yellow with age. The pigment is very finely ground with balanced proportions of binder and water to create a paint that consistently produces smooth flowing line work and brilliant opaque points and dots. It is best applied with a brush and is perfect straight from the tube for creating multiple line widths and weights. Because it is water-based, it is completely removable with a cotton swab dipped in water even after it’s dry. Its finely ground pigment removes cleanly with no residue, and once the water used to remove it has evaporated, the area can be reworked with more white or even colored back into with Copic markers. It is much more fluid from the tube than Copic Opaque White, and when thinned with water, becomes much more or less translucent, which makes it perfect for creating soft corona effects around specular highlights. Because of its versatility, UV permanence, and its ease of use, M. Graham Titanium White Gouache is the white I use in my work. So, which white is best? When it comes to using white in your Copic marker drawings, there is no right or wrong choice. Whatever white most easily creates the effect you are after is the best one for you. So…. 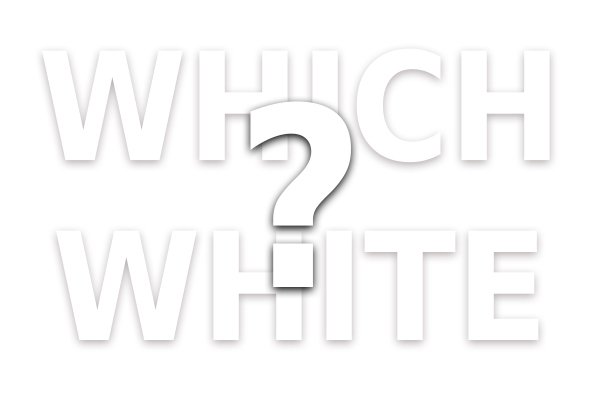 What white do you use? Let me know in the comments below! I’m curious to see if there’s one I haven’t tried yet. I, too, prefer gouache for my white. I like that it can be used with dip nibs for drawing white lines to represent things like individual hairs or animal whiskers. 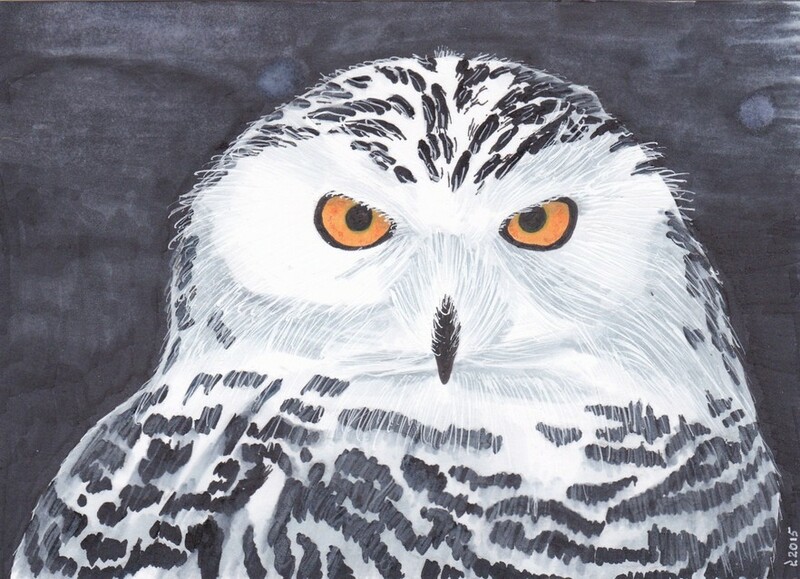 Here’s a postcard I did recently using the white of the paper, white gouache with a dip nib, and white colored pencil (to tone down some of the black stripes. 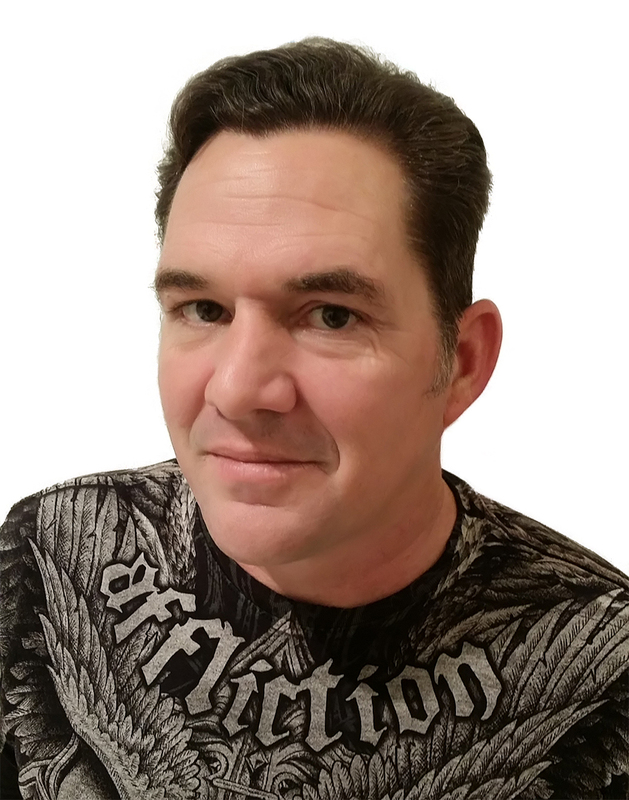 Hi Mike, thank you for sharing your technique and the awesome drawing! I’ve been using Gouache for a long time and it never occurred to me to use it with a dip crow quill pen! It makes perfect sense! I would imagine that a wide variety of effects are possible depending on if it’s thinned or not. This also seems like a great way to get good clean white outlines. I can’t wait to try it! I came across the technique while reading about calligraphy. It seems calligraphers will use pretty much anything that works in a dip pen, and while looking at some of their wonderful work with white on black, it occurred to me that this would work for drawing, too. Now if only I could get my scratchy line work to be as smooth and flowing as a calligrapher’s. 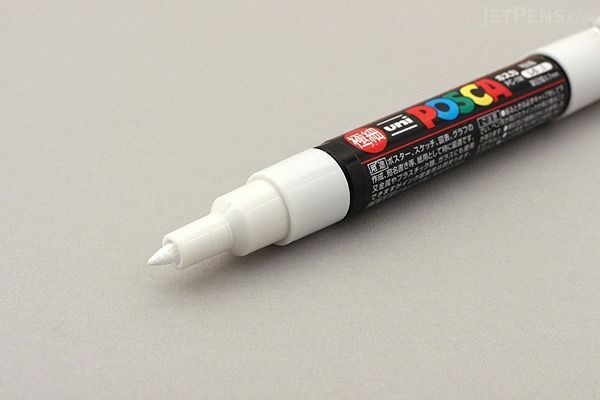 I’ve been looking for a white marker to use in colouring books, and they just don’t seem to exist. Colouring pencils often include white, so why don’t marker sets? It’s driving me mad. Copic does include white, but the names will be something like pinkish white or floral white, which suggest it’s a shade rather than a straight white colour. Am I right? Hi Jody. Yep, you’re right. Copic doesn’t make a straight white “marker”. The problem is whites are opaque, and marker inks are transparent. The only company that makes a white marker that I am aware of is Winsor & Newton. You can find them on Amazon here. I’ve experimented with their white marker a bit and can’t say I’m super fond of it, but you should give it a try. It may be just what you’re looking for. Uni Posca makes a great opaque white fine line marker. I haven’t tried it yet, but I’ve heard great things about it and seen some fantastic artwork done using it. Based on the photos I’ve seen, the tip seems to be about the same as a Copic brush tip. I sincerely enjoyed this article. I personally use Prismacolor white colored pencil for making glass look realistic or soften dark colors. I also use white gel pens for intensity and Copic colorless blender hand in hand. For example, if I was to illustrate a star, I would soften and lighten the chosen area with a Copic colorless blender to create a soft glow, and in the center of the glow I would put the star with the white gel pen. Metal roofs are on its method to reputation. Hey Buddy!, I found this information for you: "Use the Right White to Highlight your Copic Drawings". Here is the website link: https://copicmarkertutorials.com/use-white-to-highlight-your-copic-drawings/. Thank you.